Wow. It's been way too long since our last Retro Friday review! Things just kept popping up on Fridays, but now we are back to regularly scheduled programming. And the book I've chosen for you today is an absolute keeper, but one that I rarely see featured for review for some reason. It hasn't been out that long really, but it's one I feel deserves more attention. I found it back in January of 2006 while browsing the Staff Picks shelf at my local bookstore. I'm always intrigued by the staff picks at bookstores and libraries. I love seeing what other bibliophiles pick when asked to recommend one title per month or so for the masses. In this case, the cover caught me in its net immediately. I fell in love on the spot and walked out with the book in hand. The hair falling over the lip of the chipped old-fashioned tub. The ghosty hands held up before her like they belong to someone else. The faded, slightly sinister wallpaper. And then, of course, the title. If you're an Emily Dickinson fan or a reader of ghost stories, A Certain Slant of Light is a guaranteed home run. Someone was looking at me, a disturbing sensation if you're dead. Helen is dead. She has been for 130 years. And that's why she finds it so unsettling when, in the middle of her current host--Mr. Brown's--English class, she notices a boy looking at her. Looking at her as if he actually sees her. And it turns out he does. James is dead as well and occupies a young man named Billy Blake's body, whose soul fled it when his life became too unbearable to stay. But James, like Helen, is lonely. And, as he extends a hand of friendship, Helen tentatively accepts his unprecedented offer. Together they search for ways to stay near one another, to remember their past selves, and to possibly find Helen a body to inhabit. When they stumble across Jenny, it seems they've found their chance. Jenny lives a no-frills life with her rigidly religious, authoritarian parents and all spark seems to have been beaten out of her when James and Helen find her. It seems like the perfect opportunity, and for awhile the two lost souls are achingly happy--able to touch, converse, and interact together as though they were alive once more. But animating the bodies of two such different young people is fraught with danger as they try not to alert their hosts' family members to their altered states. Billy's older brother Mitch is less of a problem, though he does notice a difference, but Jenny's parents are a force to be reckoned with. And, when they make a decision that will remove their daughter even further from the outside world, Helen and James are left scrambling to find a way to remain together. When the bell rang, he slowly closed his book. The other students had already slung their bags onto their backs and were migrating toward the door. The young man gathered his belongings and turned halfway back toward me. With a flick of his head, he beckoned. I followed him closely up the aisle, out the door, down the pathway. He kept his eyes straight ahead of him. When he came to the recycling bins where we had stopped before, there were a boy and a girl there, holding hands and talking. He paused for only half a moment and then kept walking. He came around the side of the library and stopped suddenly, stepping into the phone booth beside the caged vending machine. The booth was the older style that stood like an upright glass coffin. He dropped his bag at his feet and looked me in the eyes as he picked up the receiver. "What's your name?" he said. I was breathless. "What should I call you?" he asked. It wasn't that I had forgotten; it was just that no one had asked me in a long time. He glanced around to see whether anyone was eavesdropping. Then he pushed himself back into the corner of the cramped space and gestured with one hand, inviting me into the glass booth. I was shocked, but I moved toward him, and he closed the sliding door behind me. It wasn't until then that I realized he could talk now without others hearing. He smiled, a brilliant moment. "Not really," he said. "My name is James." There was such an odd silence, he staring into my eyes, and me, well, I was so lost; I could scarcely speak. "How is it you see me?" But I wanted to cry, Thank God you do. This scene early on in the novel is one of my favorites. I love Helen and James. Every scene they share is packed with tension. But I love Jenny and Billy as well, for all they're not actually there much of the time. But a certain scene they share near the very end is, in my opinion, the best one in the book. Sometimes I flip through and read just that one, it's so arresting. 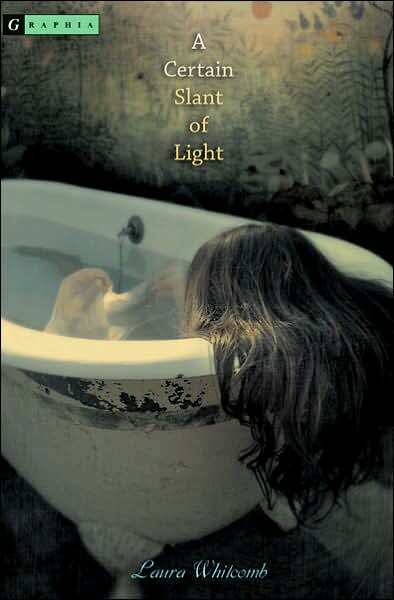 A Certain Slant of Light was marketed YA, but I really think of it as an excellent crossover novel, particularly as the bodies of the main characters are teens, but the spirits inhabiting them are adults who both died in their late twenties. It is a shockingly good debut novel and one I return to again and again whenever I'm feeling lonely or beaten down by life. Whenever I find myself dwelling on how hard it is to forgive yourself some things and how important it is not to ignore those around us because we are so consumed with our own set of troubles. Combine all these weighty issues with an exquisitely sweet love story, a mystery, and one of the most beautiful endings I've had the pleasure of reading, and I have a hard time not gushing about it to random strangers on the street. I've been meaning to read this for a long time. Eventually I'll get around to it....hopefully! That cover is creepy! This books sounds so interesting... I may have to check this one out! I heard the second book by this author isn't as good as this one and they marketed as a love story when it wasn't. I must read this one though because everyone speaks highly of it. I love this book! The relationship between James and Helen is absolutely beautiful :) I know what scene you're talking about with Billy and Jenny! It was very touching... and I liked how the author left them in a hopeful spot. Mollie, I hope so, too! Just browsing through it last night for that quote made me want to cozy in and go cover to cover. Chantele, I know! It's really effective, I think. And accurate. This is a ghost story. And a good one. Emily, ooh, you have it on hand! Let me know when you do get to it. Princess Allie, yes, unfortunately I agree with that assessment of THE FETCH. It didn't work on several levels. This one, on the other hand, gets the job done. And it definitely qualifies as a love story. Among other things. :) The awesome news is that she's working on a sequel to this one and I'm just thrilled to hear that! pirate penguin, *highfive* I'm so glad to hear you love it, too. And that scene...these two kids who've been through hell. They deserve that hope. Every bit of it. bish, yup, such a solid cover. And thanks for the link! I'll check it out. I, too, have been meaning to read this forever. Thanks Ang! 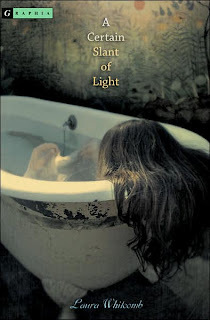 A CERTAIN SLANT OF LIGHT is one of my favorite YA books too. ahhh yes Angie! I LOVED this book when I first picked it up :D Such a perfect balance of so many things, put together so beautifully! Wow, what an excerpt! The title rings a bell, but wow, I am sold. I have to read more of this thing! Thanks for the retro alert. i absolutely love this book. the scene where the teacher reads james' library description of helen is lovely. I'd forgotten about this one. I read it a few years ago thanks to a friend mentioning it on Goodreads. There was much that I loved but also a lot that was haunting — not just in a ghost-story way, but the terrifying things going on in this story that might be more real than I want to know. Does that make sense? But after reading your review, I'm reminded of how wonderful the experience of reading it was. This makes me want to buy a copy. Thanks! Holly, it's really beautiful. Dark, but beautiful. I think you might love it. Karen, yay! More fans pop out of the woodwork. KIKA, I rather wondered if you'd read it. So glad you love it, too. It doesn't lose anything in the re-reading either. Carolyn, you are welcome, my friend. I think you'll enjoy this one a lot. heather, oh yes! That scene is a great one. Nikki, it absolutely does make sense. It's so hard to absorb the realities of Jenny and Billy's worlds. That darkness does stick with you. Though, I do find the ending sort of cathartic and full of light. Which helps. Chelle, you did!? Oh, I'm so glad you liked it. And your reviews are always lovely, silly.